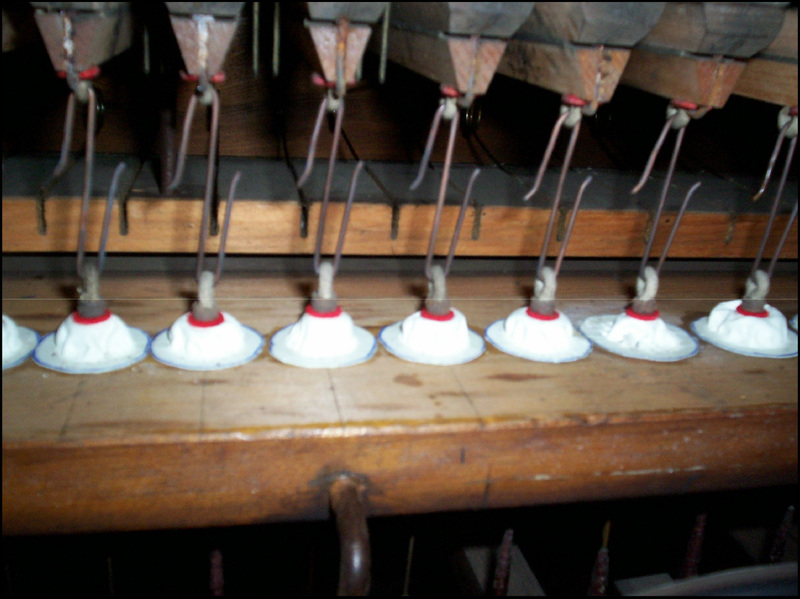 The first occasion was when fitting new split-skin pull-down teats in the soundboard of an August Gern organ at Walsall. (Also a Cavaille-Coll feature.) Early on in the procedure I concluded that trying to form and glue down teats using a strip of split-skin (as one might with puffers) was not going to work. The problem was keeping the liquid glue off the dome of the teat, which must be fully flexible; the restricted space didn`t help. After some experimentation I devised a method of pre-forming individual teats, which resembled one of Ken Dodd`s Diddymen`s hats. It was necessary to have a flat brim to the teat, which would be glued to the bottom board. A crude jig was made using a block of wood 1.1/2in thick containing a hole the same diameter as the bottom board hole and with the sharp edge rounded off. A piece of plastic with a central hole of 3/8in diameter and a piece of 5/16in dowel with the end also rounded off completed the kit. teat out of the block. After cooling the brim was trimmed to about 1/4in wide. Hot glue was brushed around the bottom board holes and allowed to dry. It was found that one ring of glue was not sufficient so it was given a second application which again was allowed to dry. As made, the teats were inside out, enabling the dome to be dropped into the hole, both out of the way and self-locating. Because of restricted space the brim was glued down using a block of steel warmed on an electric hotplate, then left overnight for the glue to set. On checking the teats the next morning revealed that several required a third application of glue, showing that a generous amount was necessary. Once all the teats were well and truly secured the domes were carefully pushed up into the pallet box. The pulldowns were fitted, with a small leather button both sides of the dome and a cloth washer under the bottom button. It seams to be a lengthy and fiddling procedure, but without knowledge of how it was done originally I had to experiment and improvise. At least the domes remained dry and flexible. One useful ruse was to make more teats than needed and use only the best! (I also do that when making small springs.) Buying in pre-formed teats from Germany would have been easier and possibly cheaper in the long run, but I would have learned nothing about making teats. The second procedure of dry gluing was during relining drawstop jamb bushes. Following removal of the old lining cloth and glue, new individually measured linings were made of red bushing cloth and kept in order. There were small, but significant, differences between each one. The width of the cloth was 1/2in wider than required for the bushes. The bushes were given two generous layers of hot glue, which was allowed to dry after each application. The cloth strips were inserted into bushes with the joint at the top; I don`t like the drawstops rubbing over a joint in the cloth. The extra cloth at the back was used to accurately position the lining to give a uniform appearance; easier to do with the dry glue. A round steel mandrel, normally used for rounding out pipes or making tuning slides, was selected, of sufficient diameter to be an easy fit in the bush without disturbing the lining. The mandrel was heated on an electric hotplate, inserted into the bush and used to press the lining to the bush and melt the glue. With using red cloth, the mandrel had to be rather hotter than the steel block on the split-skin. Both mandrel and block had to be held using a rag or old piece of leather. Does anyone have any observations or comments on these procedures? Do you do it differently?